Through our limited research we have unearthed a number of as yet unresolved questions. If you can help with any of these please contact us. He is commemorated on the Patterdale War Memorial but not on the Glenridding Village Hall Roll of Honour. Thanks to some excellent research by Norman Jackson we hope that we have finally identified him, and we now even have his photo. Read more on Norman’s research here. Why was Oliver Readshaw not included on the Patterdale War Memorial ? Private Oliver Readshaw, 24554, 14th Bn., Durham Light Infantry was born in Patterdale and baptised on the 18th October 1885. He was the younger brother of George Readshaw, and probably joined the Durham Light Infantry with him at the start of the war. Sadly he died just a month after George on the 23rd October 1915, and is buried at the Ploegsteert Wood Military Cemetery in Belgium. 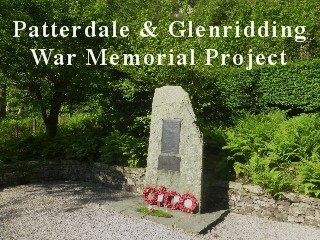 Both are listed on the Glenridding Village Hall Roll of Honour but only George’s name was added to the Patterdale Memorial. We do not know why this is. It is possible that noone was in contact with him, and judging from his brothers name being added at the end of the memorial it is possible noone knew that Oliver was dead. In 2017 we added a memorial bench to his memory next to the Patterdale War Memorial. Why was John Wilkinson not included on the Glenridding Roll of Honour? As we know John was born in Patterdale, and although he lived in Matterdale the fact that he is commemorated on the Memorial in Patterdale , and had many relatives still living in the Parish would make you think he should be included on the Glenridding Roll of Honour as well. Why Does Albert Rothery’s name have a cross against him on the Roll of Honour? As we know Albert returned to Shanghai after the war and in fact when he retired he returned to Cumbria and settled in Carlisle. Perhaps because none of his relatives were still living in the Dale at the end of the war meant that no-one realised he’d survived? Private Thomas Little, 44611, "B" Coy. 1st Bn., South Wales Borderers who died on 10 November 1917 Age 21. He died at the Battle of Passchendale. His Commonwealth War Graves Commission record states that he was the son of Son of Thomas Royal Little, and Elizabeth Ann Little, of Goldrill House, Patterdale. We know they were not living there in 1911, and may have moved here during the War. They settled in (and possibly built) Daweswood. There is an inscription to Tom on his parents gravestone in Patterdale Churchyard, stating “Tom, Their Elder Son, who was killed in action on Passchendale Ridge, Belgium, on Nov 10th 1917”. Would Tom have been excluded simply because he was not born in the Dale? If so then neither were many others on the Roll of Honour and some on the Memorial. Whatever happened to Miles Cooper? 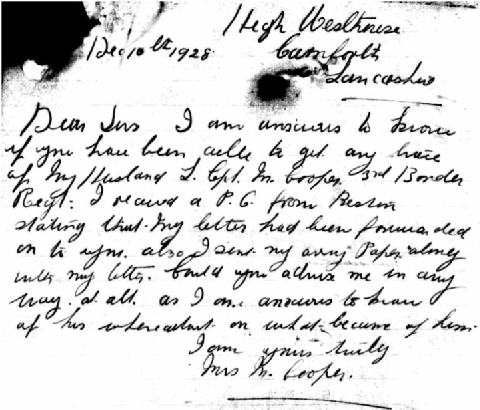 “Dear Sirs I am anxious to know if you have been able to get any trace of my husband L.Cpl M Cooper, 3rd Border Regt…Could you advise me in any way at all. I am anxious to know of his whereabouts or what became of him. I am Yours Truly Mrs M Cooper”. Were they ever reunited? You can read more about the story of Miles Cooper from what we have gathered from his Service Record, one of the few to survive the bombing in the Second World War of the Records offices in London. Who was Jas M Hawkrig? The Glenridding Village Hall Roll of Honour refers to a “Jas M Hawkrig Border Regiment”. The name appears near the end of the Roll of Honour which we believe implies that either the person joined up late in the war or that they were added late in the day to the Honour Board. So far we have been unable to specifically identify who this was so we have included the stories of the two men who may well have been referred to - John Hawkrigg and James Hawkrigg. Both served in the First World War and grew up in Cumberland and Westmorland. If you have any specific information linking either of them, or anyone else to the Dale please let us know. #facetothename - we would like to find photos of the four brave men whose names are inscribed on our memorial but for whom we have no photographs. These are Driver John Slee and Private John Wilkinson from World War One and Corporal Frank Mallinson and Corporal William Carmichael Wilson from World War Two. If you can help please click the link below.